From left to right are Claudia Miller Ina Belle Sibley, Matthew Moreaux, Garett Burns, Phyllis Stewart and Linda Caroll. 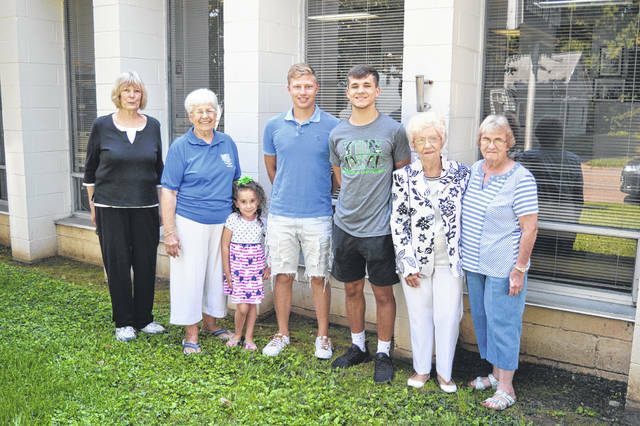 GALLIPOLIS — Each year, the Gallia Academy High School Alumni Association chooses two from the graduating class to receive a one time $1,000 scholarship. According to members, the organization has many goals and the primary one is to make sure two graduates from each class since 1995 are chose for the scholarship award. The scholarship committee meets after each school year ends and reviews all applications submitted by seniors. Many requirements for each scholarship are reviewed and the winner is determined by majority vote. Ina Belle Sibley serves as scholarship chairwoman with Claudia Miller Phyllis Stewart and Linda Carroll as committee members. This year’s winners are Matthew Bradley Moreaux and Garrett Burns. Moreaux plans to attend Ohio University and Garrett plans to attend Marshall University.